Karl Yang is a musical director, conductor, music educator and composer in China and Australia. He founded the Karlyang Music Education Centre and is Director of the China Chorus Association, a member of the Australian National Choral Association, and Director of the Australian Chinese Musicians Association. He received his Bachelor of music education in China. He studied conducting under the supervision of Dr Ronald Smart, world-renowned conductor, Chairman of the Australian International Conservatorium of Music. Karl holds a Master Degree in conducting from the Australian Institute of Music, Sydney. He has more than 30 years of music teaching and 30 years conducting experience. She received her Bachelor of music education in China, and has more than 20 years of cello playing and music teaching experience. She is a member of Cello Society Performing Arts Committee Chinese Musicians' Association and a Commissioner in the First Council of Violoncello Teachers Institute, Shandong Musicians Association. She has been the orchestra's Cello performer in China and Australian East West Orchestra. 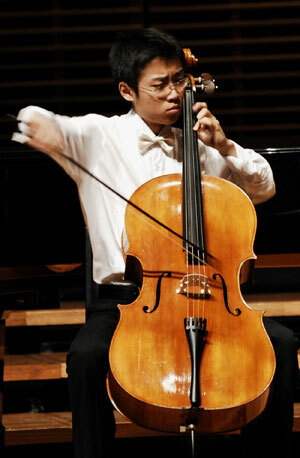 George Yang is a recent graduate of the Masters of Music (Performance) degree at Sydney Conservatorium of Music with the support of Patricia Lucas Music Achievement Scholarship. Prior to his Post-graduate studies, he completed his Bachelor of Music (Performance) under the tutelage of Georg Pedersen in 2014. During his studies at the Conservatorium, George served as the Principal cellist of the Conservatorium Symphony Orchestra from 2014-2016. His graduate recital program included the Prokofiev and Shostakovich Cello Sonatas with Phillip Shovk as Associate Artist. He was a participant of the Australian Youth Orchestra’s National Music Camp in Canberra (2014) and Adelaide (2015), in which he worked with conductors such as Richard Gill, James Judd and Douglas Boyd. He has been part of Sydney Northern Chamber Orchestra, and went on a tour in Colombia to play at the international choral music festival ‘Cantata America’ with Colombian and Venezuelan Orchestras. In addition, George has been an active member of Willoughby Symphony Orchestra, The Metropolitan Orchestra and Ku-ring-gai Philharmonic Orchestra. He has also performed in his annual quartet concert series 2014-2016 at Mount Heritage Hotel with Russian, American and French music themes each year. In 2015, George went on the Great Northern Tour with David Miller AM and four other musicians, they presented chamber music concerts in Tea Gardens, Hawks Nest, Nambucca Heads, Coffs Harbour, Dorrigo, Boambee, Laurieton, Forster, Port Macquarie, Kempsey, Taree, and Kendell. George had performed in various venues in China, Hong Kong, South America and Australia including Sydney Opera House, Angel place recital hall, Llwellyn Hall in ANU school of music, Wollongong Town Hall, Chatswood Concourse, Verbrugghen hall, Elder Hall in Adelaide, Auditorio Leon de Greiff and Club of the Professors of National University. George has been teaching cello since 2008. He teaches at Conservatorium’s Open Academy "play at the con", Karlyang Music Education Centre, Lane Cove Public School, Gladesville Public School, Lindfield Public School and Covenant Christian School. He has taught many students at different levels of musicality and understands the importance of planning and tailoring lessons according to the student's needs.